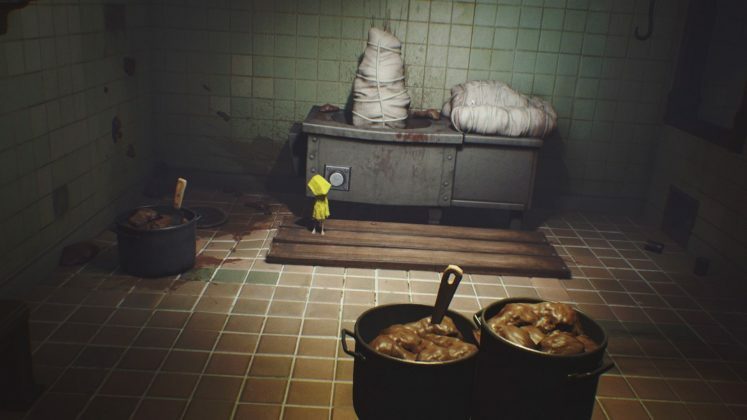 Little Nightmares is a three dimensional stealth horror puzzler published by Bandai Namco. As a young girl named Six, you will crawl, sneak, run, swing, jump, climb, and scramble your way through the belly of The Maw, a mysterious and ominous restaurant floating on the high seas. Skulk through dark duct work, scurry across beautifully disgusting kitchens, and sprint across horrendously adorned dinner tables all the while avoiding it’s giant and grotesque inhabitants. 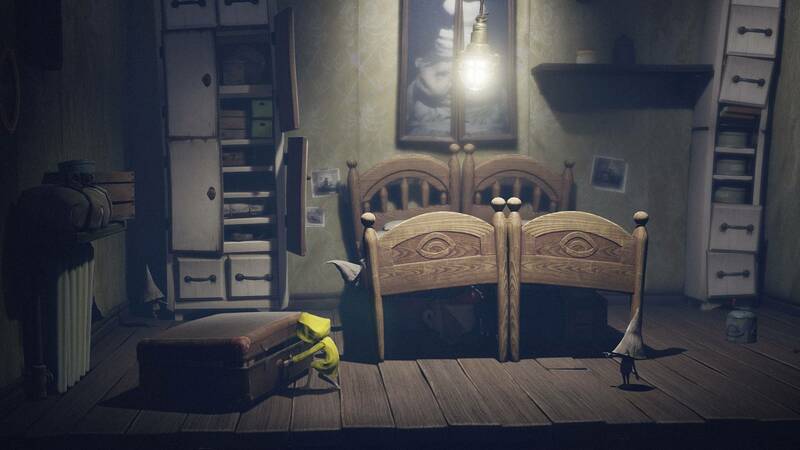 Little Nightmares has a gorgeous look all on it’s own, but is slightly blemished by story and gameplay issues. Sporting a yellow raincoat, little is known about the tiny protagonist Six. In a move designed to recall childhood fears, the rooms and denizens of The Maw loom large over her. The giant humanoid creatures you encounter are freakishly creepy and sad. They sniffle and cough while only communicating with moans and shouts. Often, Six finds herself creeping along the floor under a table, crawling through a mouse hole in the wall, or sneaking through floor ducts. Chairs are too big to sit in and door handles are too high to reach. The Maw is an unwelcoming place for our wee protagonist. 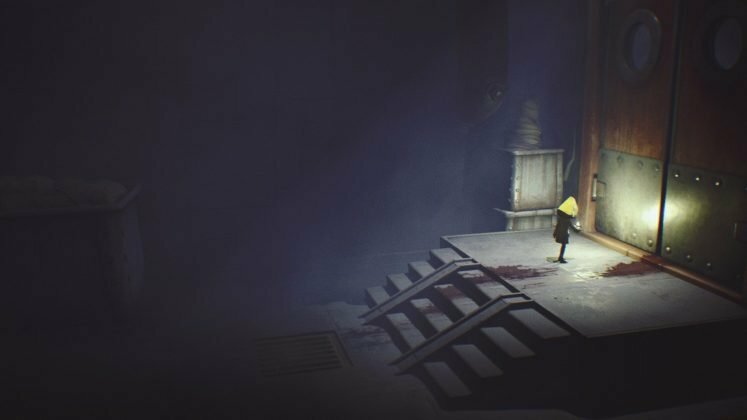 Little Nightmares is a horror game that’s more about atmosphere than jump scares. Visually, the game is beautiful with amazing detail found throughout. From bleak, dusty rooms to shelves filled with books, vases, and pictures; many of these places feel lived in. Six often feels tiny and insignificant and several times the game’s camera pulls back to show just how small she is. My favourite visual is when the camera zooms so far out when you are climbing the outside of The Maw and you can finally see just how small Six is in comparison. Upon entering a room, creatures scurry about, sometimes giving away your presence. From the furniture, the creatures, and the objects you can interact with, everything feels like it has weight. Like you could almost touch it. If you pick up and drop a bar of soap, it slides slowly back and forth across the floor as wet soap would. Almost constantly there is a gentle swaying of either objects or the floor as a reminder that you are working your way through an unknown seagoing vessel. The air itself often feels dusty. But, even more than the visuals, it’s really the sound that pulls you in. As beautiful as the game is, the sound is what really nails the atmosphere. The ship rumbles and groans and machinery hums deeply in the background. I played the game with headphones and I recommend you do the same. The floor creaks under Six’s tiny feet and the creatures sniffle, yelp, and screech when they discover you. The sound of a beating heart grows louder when Six is close to being discovered. The music is always appropriate and adds to the ambience of The Maw, whether it’s a creepy carnival type sound or a softly played menacing melody. Several times Six needs to run to avoid capture and the music speeds up adding to the tension of the moment. I loved nearly every one of my deaths. How did I die? 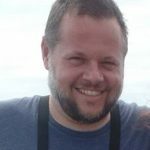 Let me count the ways: smashed, trampled, stuffed into a fish head, thrown into an oven, eaten alive, fell from a high place, squashed by a table, eaten alive, covered with leeches, eaten alive (sensing a pattern yet?). The point is, you will die. Many times; and laugh about it. Conveniently, most times when Six returns to life, it’s at a point that isn’t too far behind where you previously met your end. With the visuals and sound combining to make such a creepy and immersive atmosphere, I was constantly looking forward to the next approaching challenge. What’s behind the door with the padlock? What grotesque thing am I going to see there? It made the frustrations that I felt with dying bearable. Often I would finally work out what I needed to do in an area, but still had to do it without getting caught or without missing the jump. This is the type of frustration that makes you keep trying, followed by that great feeling of finally having gotten it right. Also, the game switches up what you need to do often. One time the answer is to sneak around and stay out of sight, while the next time you simply need to run your raincoat off to get through. Mostly, I simply found Little Nightmares to be fun. I played the game over a couple of nights and looked forward to getting home from work and rejoining Six in her world. There was a refreshing simplicity to the game that I loved. You have no inventory to worry about and no weapons to collect. You could only carry one object at a time. However, despite all of this brilliance, the game does have a couple of issues. What a world to explore. Little Nightmares may look and sound amazing, but it isn’t without it’s flaws. The gameplay itself isn’t anything out of the ordinary. 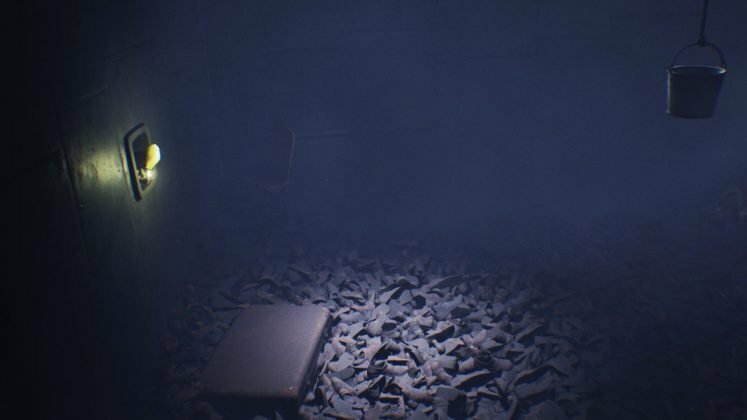 We’ve all had to find the key to open the door, jump across an impossible looking gap, find the switch to do the thing, or hide to avoid capture. 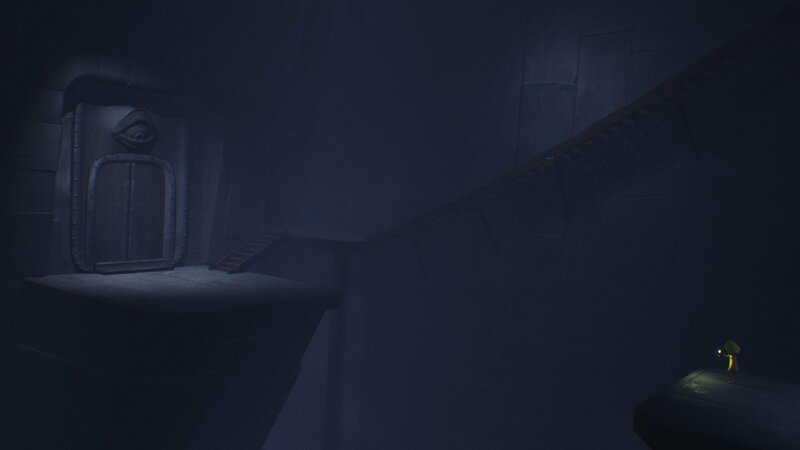 The gameplay itself has been compared to that of Limbo and the more recent Inside. It doesn’t take away from the fun of the game, however. The controls were sometimes difficult for me. I’m reviewing a PC version of the game that I played with keyboard and mouse. I died many more times than a colleague who was playing with a controller, so that may be the problem. Some of these issues were due to the nature of a three dimensional side scrolling game in which it is sometimes difficult to judge depth of field. I missed jumps repeatedly and ran into walls while trying to outrun the assorted ghoulies trying to catch me. Another flaw is with the story. Within the game, there really isn’t one. We know that the protagonist’s name is Six and that she is in a floating restaurant called The Maw. But, we only know this because it’s in the marketing materials and on the web site. Nowhere within the game itself is any of this readily apparent. At least not that I ever saw. 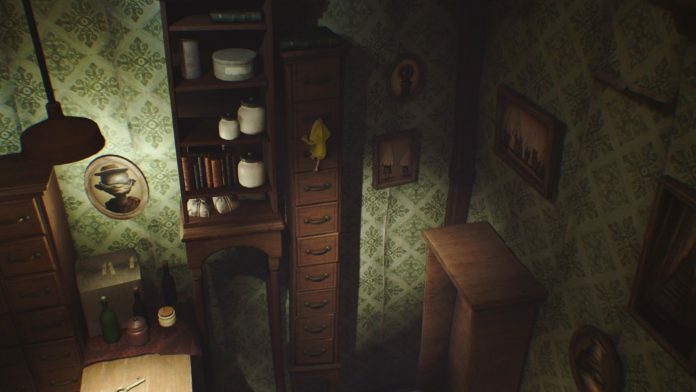 I also felt that there were some missed opportunities for background stories with some of the objects you pass by. Several times I found myself looking at newspaper clippings or what I assumed was a suicide note trying to read them. You weren’t able to. Of course, this isn’t to say that you can’t work out much of the story as you are going along, but you have no idea how Six got there or who she is. 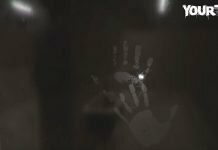 As the game progresses, Six increasingly exhibits a behaviour that is never explained, with a turn that you don’t quite see coming. By the end of the final chapter, you have no clear idea who or what Six is. That being said, this didn’t take away at all from the fun that I had while playing, but I felt it needed to be acknowledged. The game is quite short. Steam shows my playtime at 8 hours to completion, but it has been stated at around 4 hours by others. There are 5 chapters with the first one being a tutorial and the final one seemingly over quicker than the others. While there is some unlockable artwork, and a few collectable type things, I’m not sure how much replayability there is in the game. With a current $19.99 price tag on Steam, it really is up to you as to whether you see the value in it. That’s somewhat unfair in a way, as I could take my kids to a two hour movie with snacks and drinks for $50, but we’ve been conditioned to expect our games to be much longer. If this describes you, perhaps you should wait for the game to go on sale before you get it. 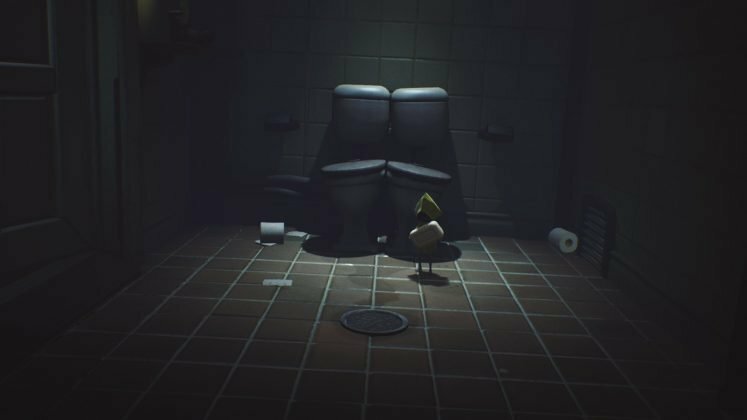 I thoroughly enjoyed my time playing Little Nightmares. The Maw is an amazingly beautiful yet creepy place to play through and the sound design is spectacular. The cast of characters you encounter will repel you, yet draw you in as you ultimately almost feel sorry for them. 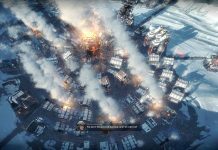 While the gameplay doesn’t bring anything new and the game itself is short, you should definitely give is a go at some point. 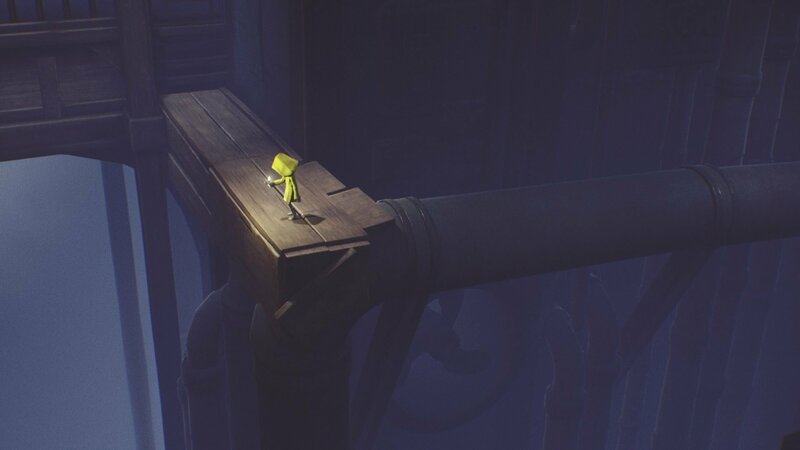 Little Nightmares was developed by Tarsier Studios and was published by Bandai Namco. It becomes available on Friday, April 28th for Xbox One, PS4, and for PC on Steam. 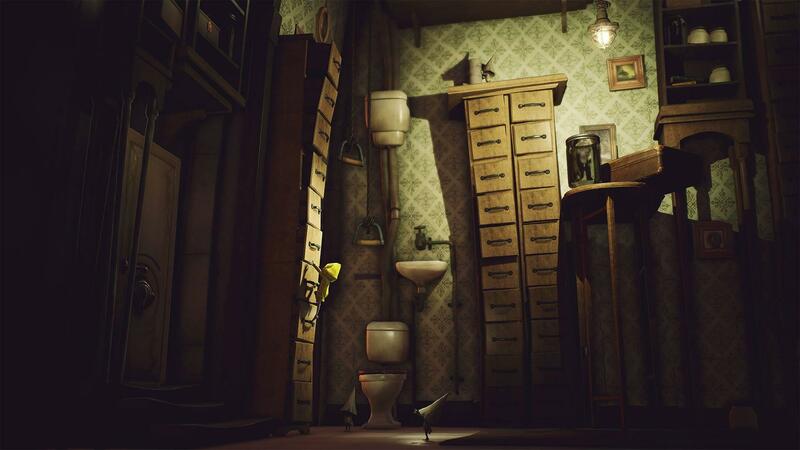 Little Nightmares is a grotesque yet beautifully immersive game that is a blast to play. The cast of characters in The Maw are hideous yet sympathetic as they seek you out in their creepy environments. The visuals are amazing, the sound design is fantastic, but the reader should know that this game is not without it's flaws. 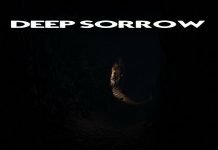 Despite story and gameplay issues, this short game is one that every fan of the genre should play.